Buy a profitable business and – unlike when starting one from scratch – you’ll have an income from day one. But you’ll also inherit a workforce – one which you’ve played no part in hiring (again, unlike a start-up). If this makes you anxious then you can expect apprehension on your new employees’ part too. They’ll be wondering if their jobs are safe, whether their roles will change and how you compare to the previous owner. Here’s some tips on buying a business and building strong relationships with your new team. Avoid changing things for change’s sake or because you feel compelled to stamp your authority on the business. By all means change things that aren’t working. And identify what the business does well and build on those strengths. But abandon the processes and products that helped it thrive in the first place and you’ll alienate your new staff. However much you seek to foster a harmonious, rewarding working environment, some staff may simply not feel comfortable with the new regime and the changes you make. Some may leave quickly, solving the problem for you. Should they stay on, begrudgingly, and resent the business’s new direction, then you may need to take a tough decision. Offering redundancy might be expensive, but it could be a lucrative way out for them and a salve for overall employee morale (though there are, of course, conditions you must meet to make people redundant legally). Building a strong connection between the workforce and the company can ensure that workers recognise they are more than just cogs in the machine. Engage with staff, seek their views on how best to take the business forward – and heed their advice. This isn’t just an exercise in charming your new employees; after all, having worked there much longer, they will understand the business better than you. This open engagement should extend beyond the products or services to business practices and policies. Open two-way communication will flag up issues before they become problems and nip resentments in the bud. Employees should have a clear understanding of what is expected of them. To this end, consider introducing a periodic performance review for each individual, if such a system isn’t already in place. The review should assess their performance in reference to meeting pre-established goals – for example, targets for output, sales figures and so on. 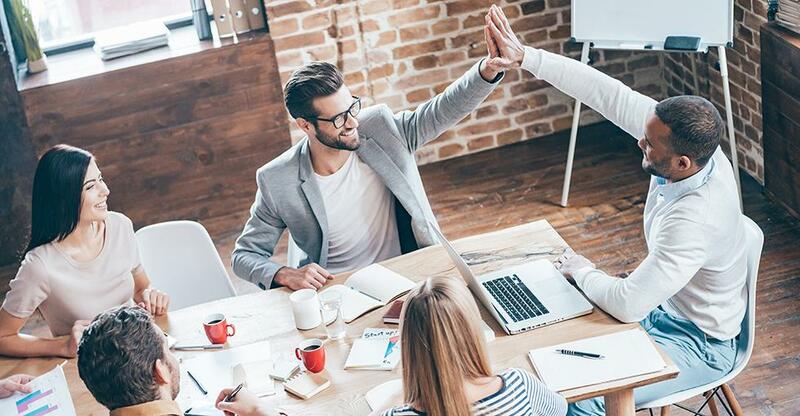 Some staff might not like it, but it at least gives them fair chance to rectify any problems and offers the motivation of a clear pathway to promotion and financial rewards. You should also encourage them to air their own thoughts – positive and negative – about their own progress and that of the company. This gives both parties a chance to improve performance and the employee-employee relationship. It’s vital to recognise and reward strong performance. If, say, the company has a good track record for handling enquiries, it’s worth drawing attention to it and identifying those responsible. Showing appreciation doesn’t just mean material rewards – though some combination of bonuses, pay rises and other perks (such as an extra day’s holiday or gift vouchers) are obviously necessary incentives. Verbal praise is an often underrated form of reward. The performance reviews offer the ideal framework for judging when recognition and rewards are merited. One way of showing appreciation, while also promoting company cohesion, is providing plenty of opportunities for socialising. Informal get-togethers beyond the pressures of the work environment – and yes, aided sometimes by alcohol – can be enormously helpful in cementing budding friendships and cooling animosities.